Buick gathered the attention of both industry members and enthusiasts recently at the Chicago Auto Show, when the American automaker revealed an aggressively styled, Jaguar-like model that appears to have come right from the future: the Buick Avista Concept. You can explore some images of the Buick Avista Concept model here, via CarScoops, to get a good look for yourself. Though many official stats and figures have yet to be released for the concept car, experts are suggesting that such a car could get up to 400, or maybe even 500, horsepower. Tragically, it doesn’t appear that the Buick Avista Concept will go into production anytime soon. However, Buick’s usage of 3D-printing to create many of the model’s aspects makes us hopeful for the future. What spin will Buick put on their Avista Concept next? While we wait, visit us anytime at Rivard Buick GMC to check out the available Buick models we have waiting just for you! 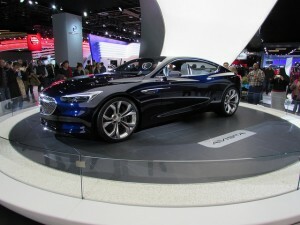 This entry was posted in Buick Avista, Buick Concepts. Bookmark the permalink.